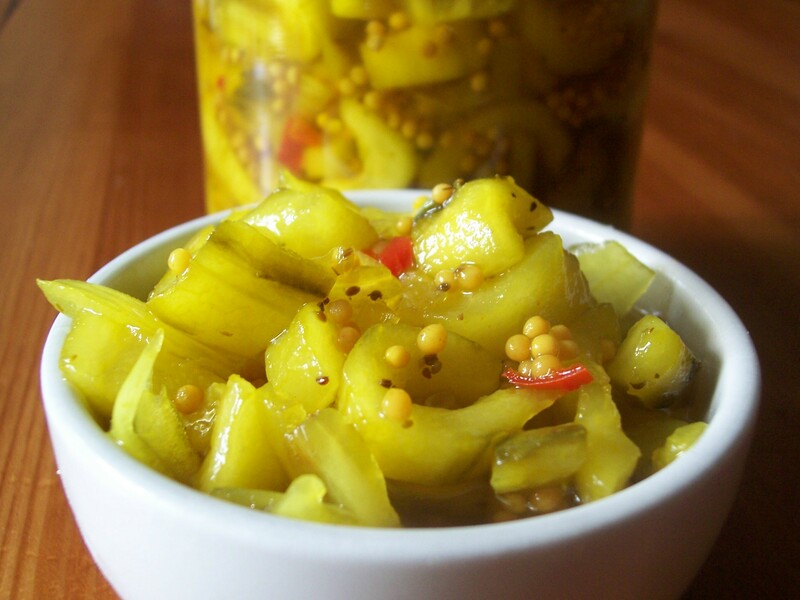 Some time ago I added a recipe to this site for Cucumber Bread and Butter Pickle. Put simply, this is a pickle to eat with bread and butter, perhaps alongside some cold meat or cheese. (I actually enjoy it on its own in a sandwich.) The original recipe was a fairly traditional one and shortly afterwards I added a second version with coriander seeds which gave a citrus flavour to the pickle. (Well at least I think coriander seed tastes a bit lemony!) Here is a third version: different again, this time with a spicy bite from the chilli and mustard seeds and called American style, though I am not quite sure why. I love this one, but next time will make sure I have washed off the salt a little more thoroughly. The first batch was fine but the second needed either an extra wash or perhaps I should have used a little less salt – it was rather too salty for my taste. The salting is essential as without this step, which draws out the excess water in the cucumber, the pickle would go mouldy. All of the cucumber based bread and butter pickles are worth making in the summer months when cucumbers are plentiful, but a smaller quantity can be made at any time of the year, especially if you can find a good offer on the market. Adjust the chilli according to taste: I added a very small one the first time but find I am increasing the quantity with each batch I make. Just a word about the vinegar: this version uses cider vinegar but another type such as wine or malt can be substituted, however it should be at least 5% proof in order for the recipe to be successful. If you substitute malt vinegar the distilled clear type will better preserve the bright colours of the ingredients. The recipe comes from Pam Corbin and the spin off series from River Cottage, River Cottage bites. I scribbled down the ingredients from the television and am pretty sure they are right. I expect the full recipe is in one of the two River Cottage volumes that Pam has written but I am not sure. Now I just have to decide which recipe to make each time! 1. Peel the cucumbers, cut off the ends, quarter lengthways and slice into 3-4mm thick slices. Peel and chop the onion fairly small pieces (no larger than the pieces of cucumber). Mix the cucumber and onion pieces together in a non metallic bowl. 2. Sprinkle over the salt, gently toss through the cucumber and onion and leave for 2 hours. 3. Rinse the cucumber and onion well in icy water. Taste check the cucumber and rinse again if it is too salty. To dry see note above. 5. Place the vinegar into a saucepan that will be large enough to eventually take all the ingredients. Add the sugar, turmeric, celery seeds, white mustard seeds and chopped chilli. 6. Heat gently so that the sugar has dissolved, stir to combine and bring to the boil. 7. Add the cucumber and onion, stir and bring back to the boil. Cook for 3-4 minutes. It needs this long to destroy any bacteria which could cause the pickle to deteriorate. Any longer and the pickle will be less crisp. 8. Pot while still hot into the pre-prepared sterilised jars. Screw on the lids well and then turn upside down until cool, which helps with the seal, after which they can be labelled. This can be eaten immediately but also keeps well.